/ How do I delete sent messages in Facebook Messenger? Well, I’m sorry to report that Facebook isn’t giving us massive digital superpowers as you hope. You can’t do what every politician and celebrity wish they could do, back up weeks, months, even years and delete any and everything that’s poorly phrase or open to misinterpretation. If only! What you can do, however, is have a ten minute grace period during which time you can change your mind and delete one or more messages. So you need to be quick on the draw, frankly. No “morning after” changes so this isn’t going to save you from drunk IM’ing either. Anyway, Facebook does a pretty poor job of explaining this ten minute window, as you’ll see. As you can see, move the cursor over your message – on the Web interface, at least – and it’ll show you the date and time that the message was sent. More importantly, notice to the left of the message that a “•••” link and an emoji silhouette both show up. Click on this option and you’ll be able to remove the message. Sort of. Here’s where it would be useful if Facebook had an additional note “Messages more than 10 minutes old cannot be removed for all users” or something, anything, that indicates why you aren’t seeing the remove for everyone option! Ahhh, that’s what we want! Again, though, there’s no indication that ten minutes is such a critical duration. 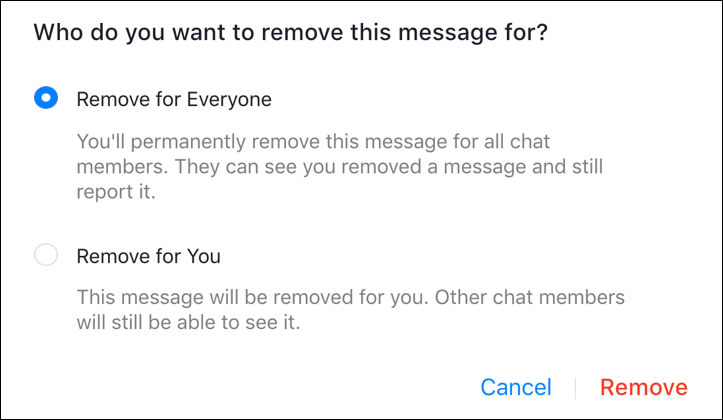 Still, you can indeed remove messages you’ve sent within Facebook Messenger from everyone who was a recipient as long as you move quickly. There is, of course, an issue of time, however: If you and I are chatting via Messenger and I see your message, then it vanishes, you can’t wipe it from my brain (or prevent me from having taken a screen capture with the message shown). That’s just the constraints of our physical reality, of course, and there’s no way that even the bright sparks at Facebook can fix that! So there ya go, everything you wanted to know about removing messages from Facebook Messenger. Now, be careful out there and think before you send, lest you bump into that ten minute limit! Pro Tip: I’ve been writing about Facebook since the site first went live at Harvard. Please check out my extensive Facebook help area here on the site while you’re visiting! Also, why not follow us on Facebook too and gain access to exclusive content? Just click: AskDaveTaylor on Facebook.